Alongside Fela Kuti and Africa ‘70, Ali Farka Touré and Angélique Kidjo, Orchestre Poly-Rythmo are one of West Africa’s most cherished and ground-breaking acts. 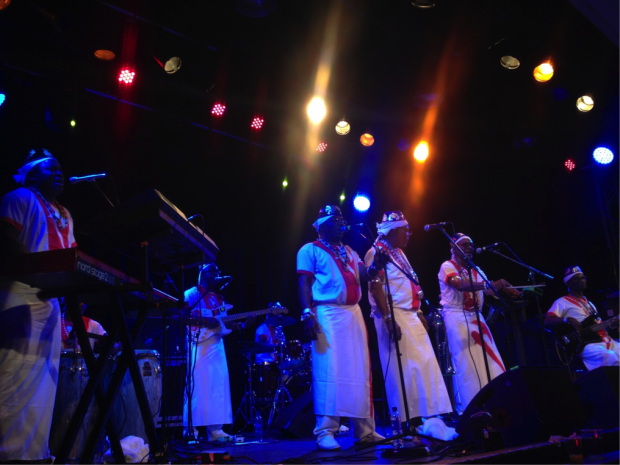 The afro-funk outfit, who formed fifty years ago in Benin, will play their first ever Manchester show at Band on the Wall on 21st June. The group hadn’t performed outside of Africa until 2009, but since reforming they have more than compensated for lost time. They’re recognised internationally for their joyous and deeply rhythmic fusion of Vodun ritual music, U.S. funk, Ghanaian highlife and Nigerian afrobeat. Having delivered captivating performances in many of Europe’s cultural hotspots in recent years, original members Vincent Ahehehinnou, Gustave Bentho and Loko Pierre continue to lead today’s powerhouse ensemble. They assemble live sets from a catalogue of more than 500 original songs, with a zest for music as strong as during their formative years.